The whitewashed former fishing village of Estepona in Spain is one of the Costa del Sol‘s most enchanting destinations. Even better, the fact that it’s often overlooked in favour of nearby Marbella means you can discover its charms in peace and quiet. Here are the top ten things to see and do in Estepona. There’s no better way to acquaint yourself with Estepona’s singular charm then by getting lost in its oldest quarter, which extends northeast from the beach to the Avenida Andalusia and west to Avenida Juan Carlos I. Its pristine cobbled streets are lined with whitewashed houses, the façades of which are attractively adorned with colourful flower pots. And because of Estepona’s relative obscurity, you can enjoy them in peace and quiet, savouring its unmistakably Andalausian beauty as you wander. 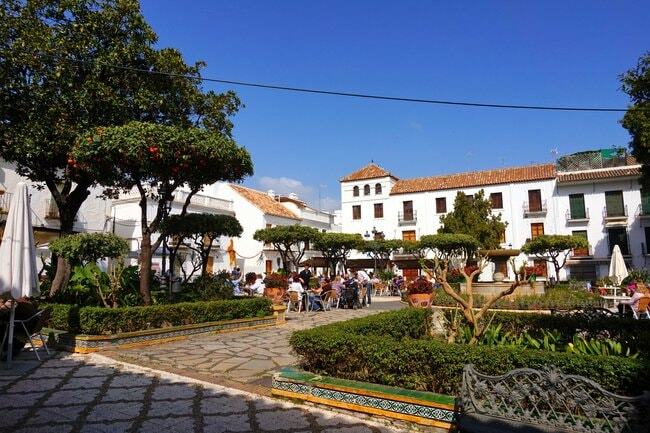 The old town’s main square is Plaza de las Flores, to which all the winding little lanes eventually seem to lead. Surrounded by old Andalusian townhouses and orange trees, it fills up with sunny terraces in the summer, making it the best place in town for tapas or drinks. The chairs and tables are arranged around a lovely central fountain, itself encircled – in true Estepona fashion – by pots overflowing with brightly coloured, aromatic flowers. A square that gives any of the most beautiful in Granada or Seville a run for their money. Opened in late 2015, Estepona’s Orchid House (orquidario) is one of the town’s newest and most popular attractions. Its central 30 metre (98 feet)- tall glass dome rises organically amongst the whitewashed apartment buildings that surround it and is flanked by two smaller domes of 16 and 6 metres (53 and 20 feet) in height. Inside you’ll find one of the largest collections of orchids in Europe, with 8,000 species displayed on a circuitous, self-guided route that also takes you behind the attraction’s 30 metre (98 feet)- high waterfall. Entry is €3 (US$3.60). 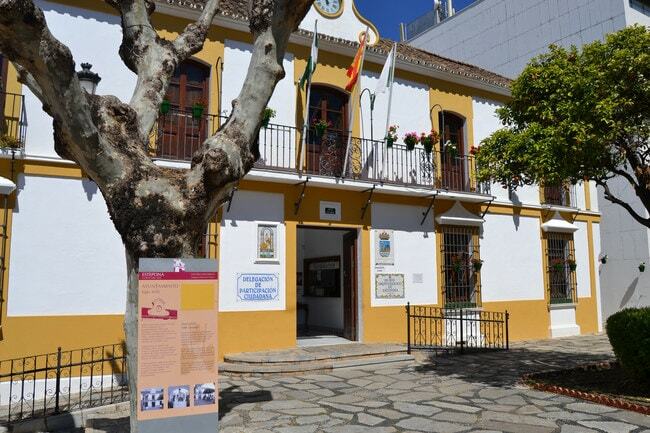 Estepona’s Archaeological Museum is located on one of the town’s prettiest squares in a stately building that used to be the town hall (and which is still called the town hall). Its permanent collection is comprised of more than 400 artefacts, some of which date back as far as the Palaeothic era 100,000 years ago. Its most precious piece is a little clay figurine barely 5 centimetres (2 inches) long called the ‘Venus of Estepona’; believed to be over 5,000 years old, it was discovered in 2011 during the construction of a nearby hospital. Entry is free. 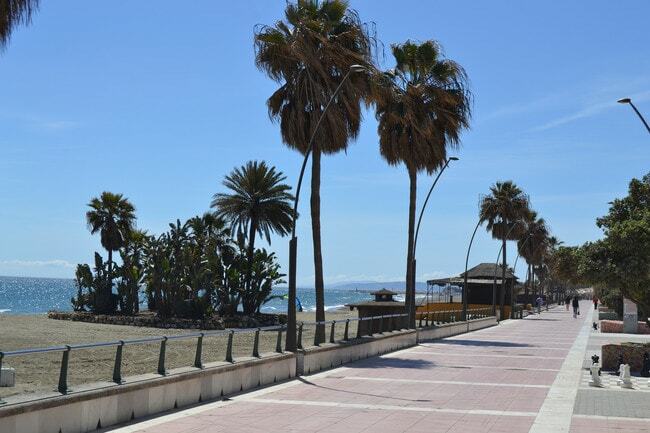 Playa Rada is Estepona’s main beach and is located just a five-minute walk from Plaza de las Flores, via the elegant Paseo Maritimo Pedro Manrique. Owing to the greater fame of the town’s coastal neighbours – in particular Marbella, Fuengirola and Torremolinos – Rada is likely to be less crowded than nearby beaches, but its clean dark yellow sand and bright blue waters are every bit as inviting. Rada backs on to a row of cool little chiringuito bars, so a cool beer and a plate of fresh, fried sardines is never more than a few feet away. Situated at the western end of the Paseo Maritimo Pedro Manrique, Estepona’s lovely whitewashed bullring is unique in Spain. Built in 1972, its architect Juan Moro Urbano designed the ring asymmetrically, ensuring that top-most rows of seating could be reached without steps. This quirky feature results in the ring’s slightly bizarre external appearance, whilst from inside it looks like any other plaza de toros. Though it now only hosts one or two bullfights a year, it is used frequently as a concert venue, houses three museums and is the site of a craft market every Sunday morning. Though more controversial than ever, bullfighting is still an integral part of Andalusian culture. You can acquaint yourself with some of the history of this complex art form with a visit to the excellent bullfighting museum in Estepona’s bullring; here, you’ll find a range of artefacts and instruments from the world of the bulls well as elaborate trajes de luces – ‘suits of lights’ – that have been worn by some of Spain’s most important matadors. Entry is free. Estepona’s characterful bullring also houses the Paleontology Museum, which displays one of the largest fossil collections in Europe. Of notable importance are its sirenian (‘sea cow’) fossil – the only one to have been found in Andalusia – and its collection of echinodrens (sea urchins) from the bed of the Guadalquivir river. The latter features one of the largest sea-hedgehogs ever found in Spain. Amongst its 1,200 species of marine invertebrates are also some of the oldest fossils ever to have been unearthed in Estepona. Entry is free. This intriguing collection of more than 2,000 pieces explores the two industries that have shaped Esteponian culture over the centuries – namely, agriculture and fishing. It is split over several themed rooms, each of which displays tools and early machinery used to ply trades such as beekeeping, threshing, the rearing of livestock, forging and fishing. As with the museums mentioned above, it is located in the bullring, and entry won’t cost you a cent. Whether you’re after tapas or a full meal, you’ll enjoy some of the freshest and best-cooked fish for miles around in Estepona, a town that boasts some of the finest seafood restaurants in Andalusia, if not the Mediterranean. These are scattered along Playa Rada and a little further west on Estepona’s port, but two of the best are La Escorella – where the fish is thrown on to the grill pretty much straight off the boat – and El Pescador, which does a mean paella and huge mussels.